In the morning we attacked the twisty road 11 towards Prague. At places the road had splendid hairpin turns where the Ducati and Triumph really were at their best. The Ural was also doing OK, but with the Russian tyres some of the turns were quite difficult. Scenery was simply splendid with lots of rolling green hills and forests. The trip to Prague went well but the actual city traffic was very muddled. Near the center we were passing a crossing when the lights turned yellow. As driving in Czech is rather agressive, Bergie decided to stop. Skoll did a swift breaking and got his bike into a fast slide on the left side, ripping one buckle from Bergie’s saddlebags. Suddenly the tyres again got grip and the bike fell on the high side, hurling Skoll with somersaults into the road. Typically to the local traffic, no car drivers stopped to see if we needed help, and we needed to hoist the bike on the sidee of the road for repairs dodging incoming traffic. Both crash bars were bent, but otherwise the bike seemed to be in good order. Skoll had hurt his other elbow in the crash, but helmet had prevented further harm. After recovery we continued the way towards city center. Prague’s center is very difficult to drive in because of strange one-way systems and pedestrian areas. We managed to get to the hostel we had reserved despite this, and checked in. When we got to the hostel room we had reserved, we noticed that there were already people there. Upon investigation the receptionists found out that they had overbooked, and of course there was no room. After the crash and carrying the gear in leather clothes in mid-thirties heat we were rather pissed off a this. However, in the end they were able to find a free room for us, and we got free beers for the night, so everything was acceptable. The hostel’s bartender turned out to be a fellow biker, and we had a long chat about bikes. He also gave us instructions for the local heavy metal bar, Hell’s Bells (Na Belidle 25 in Smichow near Andel metro station). Hell’s Bells was a real metal cave. the entrance was on a small sidewalk and went down two cases of stairs. It seemed that the room had been previously used for storage. Despite signs like ‘Rockin’ Paradise’ the music was good old school black metal a la Marduk and Gorgoroth, which made Skoll feel himself at home. In the end of the evening they showed the Iron Maiden Rock in Rio DVD on a video projector. Unfortunately the day was Sunday - the only day the place was not open 24 h - so it closed at midnight. When we got out from the Hell’s Bells and started wondering what’s the actual address of the place (so that we’d know were to come back later), we asked help for two girls who also were leaving. Other one of them spoke pretty good english (something most of the people don’t do here) and as she was a fan of finnish metal scene we had lots to talk about. As there wasn’t any good place to continue to near by, we took a taxi back to the Hostel where we continued drinking and chatting with the other girl until 5 in the morning. Normally the hostel bar would have closed at one a.m., but the bartender stayed with us drinking and playing table football. The other girl had had a little too much to drink and spent most of the time in toilet. the girls’ friends will reputedly be jealous because they met Finns. The next morning, after 4 hours of sleep and definately not feeling sober yet we planned to pay for another night and continue sleeping. But because the hostel was fully booked we had to hit the road again. We drove to the bikeshop the bartender at the hostel had reecommended and Bergie had his Triumph’s chain tightened and Skoll decided it’s time to change the Russian plastic tyres to western ones. We will have to see whether the Avons help to reduce slipping, although Skoll’s braking technique could definitely be improved. The bike shop (Motoraj, Novovysocanska 892, Praha 9) also had a biker bar attached to it where we went to wait for the tyre change and heal our slight hangovers. 27 July 2002 in Helsinki, Finland. 5 minute read. 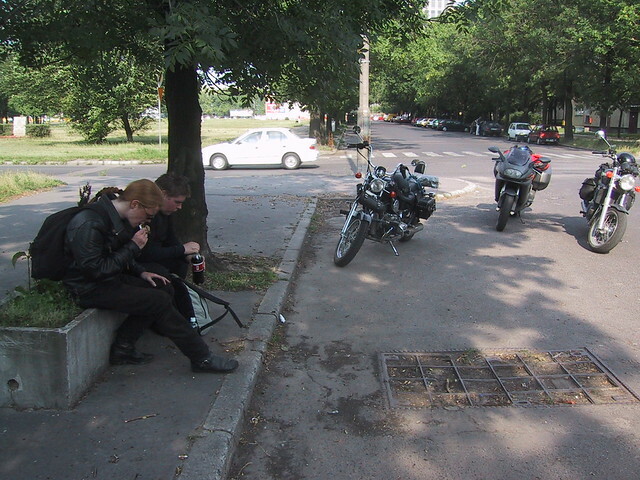 13 July 2003 in Veliki Luki, Russia. 3 minute read.